August 2014 – Obi-Wandi, a retrogaming retrographer. Retro Asylum, the UK’s No. 1 retro gaming podcast show, featured an outstanding episode dedicated to one of gaming industry’s most divisive developers, Psygnosis (click here to listen to RetroAsylum’s Psygnosis special). I contributed a segment on one of Psygnosis’s earliest releases, the trading-resource management shoot ’em up crossover Terrorpods. A mysterious box bearing familiar logos from the glory days of 8/16bit computing contains the Commodore 64 version of Terrorpods, one of the first games to take advantage of the then new groundbreaking platforms Atari ST and Commodore Amiga. 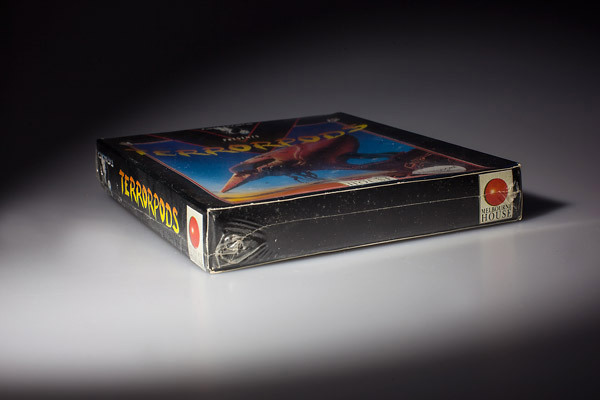 In the weeks leading up to the Psygnosis-podcast’s release, RetroAsylum regular Sam Dyer kindly pointed out to me an exciting ebay offer, a sealed copy of Terrorpods for the Commodore 64. Quickly did I jump at this opportunity to come full circle and procured said 8bit conversion. Box in hand, how did the C64 incarnation fare in comparison to the 16bit classic?